Affectionate, charming portrait of the English countryside chronicles the adventures of its whimsical inhabitants, including shy but curious Mole, personable Rat, pleasure-seeking Toad of Toad Hall, and Badger, the reclusive philosopher. A favorite for reading to young kids. nearly thirty years there and became the Secretary of the Bank at the age of thirty-nine. He retired from the bank right before The Wind in the Willows was published in 1908. He wrote essays on topics that included smoking, walking and idleness. Many of the essays were published as the book Pagan Papers (1893) and the five orphan characters featured in the papers were developed into the books The Golden Age (1895) and Dream Days (1898). 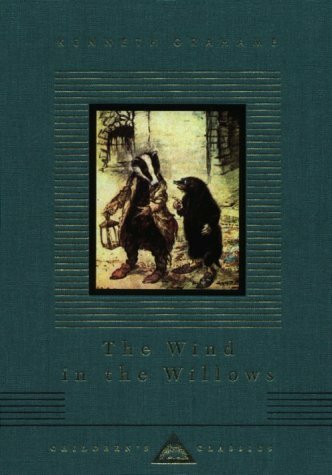 The Wind in the Willows (1908) was based on bedtime stories and letters to his son and it is where the characters Rat, Badger, Mole and Toad were created. In 1930, Milne's stage version was brought to another audience in Toad of Toad Hall. Grahame died on July 6, 1932.
sketch an outline of his drawing, then lightly block in shapes and details. Afterwards he would add lines in pen and India ink, removing the pencil traces after it had dried. With color pictures, he would then apply multiple washes of color until transparent tints were created. Arthur Rackham died in 1939 of cancer in his home in Limpsfield, Surrey.